This month, we’ll take a look at the white mulberry, Morus alba. In the Species of the Month series, we’ve looked at some truly amazing plants and fungi. I thought I would make it easy on myself by doing a “simple” tree. Well, I thought wrong. 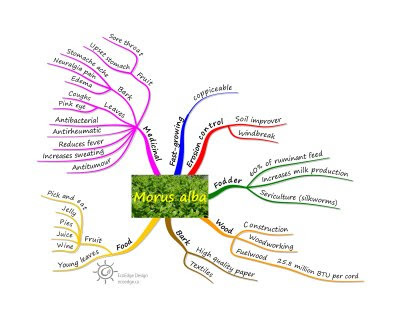 I knew some of the uses of this tree, but as it turns out Morus alba offers many benefits and carries out many different tasks. First off, this fast-growing tree is useful for controlling erosion. It also provides shade and can act as a windbreak. The leaf litter improves the soil. White mulberry has been adapted to many climates from tropical USDA zone 11 to chilly zone 4. The tree is coppiceable and survives short-rotation coppicing very well – I have seen M. alba thrive on a 2-month coppicing cycle, which is an amazingly short rotation. Mind you, this was in the tropics. Mulberry would not last very long on such a short cycle in temperate climates. Mulberry can be propagated through coppicing or through seeds. Coppice shoots can be cut and treated with rooting compound or the coppice stool can be covered with soil after the shoots are around 30 cm tall. Left under the soil, the buried part of the shoots will grow roots. The shoot can then be carefully dug out and cut for transplanting. When propagating from seeds, soak the seeds in cold water for 1 week before planting. Mulberries grow best in dry to well-drained soils. The wood is useful for both construction and woodworking. As a fuel, it will produce from 4370 to 4770 kilocalories of energy per kilogram or around 25.8 million BTUs per cord, making it an excellent fuel tree. In coppice production, it would make a goode fuel tree, provided it were grown in a small-scale operation. The bark from mulberry has its uses. It is used to make high quality paper and can be made into textile. The leaves can be used for fodder. Ruminants can be fed up to 60% of diet with mulberry fodder. Mulberry also increases milk yields in cows. The leaves are also famously used in sericulture – raising silkworms. For this, mulberry is grown on short rotation; the leaves are chopped and then fed to silkworms. Mulberry leaves being chopped for silkworms. Silkworms fed on white mulberry leaves. Mulberry can also be used as human food. While the young leaves can be eaten, it is the fruit that is sought after. High in vitamin C, iron, calcium and potassium, the berries are very tasty. Unfortunately, the only way to enjoy fresh mulberries is to pick them. Being quite fragile, they do not pack or transport well. Mulberries are used to make jellies, pies, juice and wine. There are plenty of medicinal uses for mulberry as well. It has antibacterial properties, is used to treat rheumatism, reduces fevers, and helps induce sweating. The leaves are used to treat insect bites and the cineole content in the leaves makes them useful as an expectorant. The limone in the leaves has antitumor properties. Some research suggests that the leaves could be used to help prevent type II diabetes. The fruit is used to treat upset stomachs and sore throats. And the bark is used to treat stomach aches, neuralgia pain and edema. If you have the right conditions and the room, a mulberry tree would make an excellent addition to your permaculture garden.